Is the Seafood You Eat Caught by Slaves? Meet the Pulitzer Winners Who Broke Open a Global Scandal | Democracy Now! Associated Press Burma correspondent and co-author of the “Seafood from Slaves” series. Pulitzer Prize-winning Associated Press national writer and co-author of the “Seafood from Slaves” series. Update: On Monday afternoon the all-woman Associated Press team won the Pulitzer Prize for Public Service for this investigation. StoryFeb 14, 2007Child Labor: The Hidden Ingredient to the Billion-Dollar Chocolate Industry? AMY GOODMAN: This is Democracy Now!, democracynow.org, The War and Peace Report. I’m Amy Goodman. We’re on the road in San Francisco. Is seafood on the menu tonight? Well, there’s a chance it might have been caught by a slave. That’s what the Associated Press uncovered when reporters traveled to the remote island of Benjina in Indonesia. They found workers trapped in cages, whipped with toxic stingray tails for punishment, and forced to work 22 hours a day for almost no compensation. The video is part of the AP’s groundbreaking report on slave labor in the seafood industry. Listen. NARRATOR: Some of the slaves are kept in cramped cages, sitting on concrete floors. Flies buzz around the rusty bars that imprison them. Kyaw Naing just wants to go home. KYAW NAING: [translated] I am not fed enough, as well. I feel so sorry it’s not only me. It’s everyone that people are sad. NARRATOR: Another man says he was shipped here with fake documents against his will. MAUNG SOE: [translated] They tricked me. They lied to me and put me on the boat. NARRATOR: They are two of potentially hundreds of modern slaves in Indonesia forced to work boats that supply fish that can taint an export supply chain of products sold in the United States. They’re forced to work at times 22-hour days, with no days off and little or no pay. Some claim there are beatings. At times, men die. AMY GOODMAN: According to the AP, some of the seafood caught by slave laborers winds up in American grocery stores, restaurants, even cat food. The AP dug into customs records and found U.S. recipients of slave labor seafood include Wal-Mart, Kroger, Albertsons, Safeway and others. As a result of the AP investigations, more than 2,000 trapped fishermen have been freed, more than a dozen alleged traffickers arrested, and millions of dollars’ worth of seafood and vessels seized. This is the story of one of the freed men, Myint Naing. NARRATOR: This is the homecoming freed slave Myint Naing has been waiting for all his adult life. Tricked into becoming a slave on a fishing boat as a teenager, he hasn’t seen his family in Myanmar for 22 years—until now. That’s his sister, who was just 10 when they last saw each other. Moments later, he sees his mother. The emotions are overwhelming. For his mother, it is too much. She collapses and has to be revived. MYINT NAING: [translated] I’m so very, very happy that I’m able to see my mother and my own siblings again. Unendingly happy. 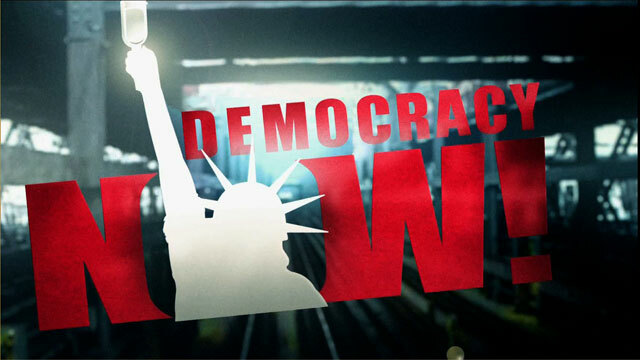 AMY GOODMAN: Well, Democracy Now! recently spoke to two of the reporters who broke this remarkable story. Robin McDowell is the Associated Press Burma correspondent. Martha Mendoza is the Pulitzer Prize-winning Associated Press national writer. We caught up with them in Los Angeles on our 100-city tour just before they headed to the University of Southern California to receive the 2016 Selden Ring Award for Investigative Reporting for this remarkable series. It’s also a contender for the Pulitzer Prizes, which will be announced today at 3:00 p.m. Eastern time. I began by asking Robin McDowell how she discovered this slave island in Indonesia. ROBIN McDOWELL: I had been living in Southeast Asia for nearly two decades, together with colleague Margie Mason. And we had been hearing for years, as many had, about the use of forced labor on fishing trawlers in the Thai fleets. It was something that was reported largely, at that point, through people who had been either rescued or had run away off of ships. No one had actually spoken to men who were on boats or captive on the islands, as we had found. So, the goal from the very beginning was to find a way to find people who were actually captive slaves, to trace that fish back to the American dinner table and, most importantly, to name names. AMY GOODMAN: And how did you do it? ROBIN McDOWELL: Well, it took about a year of networking, talking—you know, scrolling the internet, going through documents. And it really was—everyplace that we went, people told us, basically, “Yes, others have tried this. It’s nearly impossible.” Documents are regularly falsified. People lie. There is trans-shipment on reefer ships, you know, so, in other words, clean fish, fish that is caught legally, is mixed together with slave-caught fish. At the auction markets in the Thai port town, fish is bought by, you know, companies that don’t know—at that point, there’s absolutely no trace of what fish has been caught by forced labor and what fish has not. So, it was really something that was so murky, we had to get it little piece by piece. And we really didn’t know what we had, until we were told that there were some men who had been abandoned on islands in Indonesia. And so, it was basically going there and finding it and hearing their stories that they tell. AMY GOODMAN: So tell us what exactly you found there. ROBIN McDOWELL: Well, initially, on arriving on the island, it looked like a huge fishing company. Things didn’t go quickly. We didn’t find immediately—or we didn’t realize immediately this was an island of slaves, that this was slave labor. AMY GOODMAN: This is Benjina, Indonesia? ROBIN McDOWELL: This is Benjina, yes. The village of Benjina is on one side of a large canal. About 200 meters away is the other part of the island. And that’s where the factory was, with the boats, the fishing trawlers, the men. So, for the first day or two, it was mostly looking across that waterway, trying to figure out how are we going to find out really what’s going on here. Initially, the first clues came from the brothels on the side of the village, which, it turned out, on speaking to them, that they were servicing mostly Burmese fishermen, and they said dozens, maybe hundreds. So that was when we really got a sense, OK, this is—this is a big operation. It wasn’t until two or three days later, when I was able to get in touch with our Burmese colleague, Esther Htusan, who is also a member of the team, and she embarked on a 30-hour journey by boat, by plane, and arrived on the island. When those men saw her and for the first time saw a Burmese compatriot and she told them, “We’re here to tell your story,” they just could not wait to talk. They took tremendous risks. They would chase us down pathways, kind of jamming paper into her hands, saying, “Please, tell our family that we’re alive,” telling horrific stories, much worse than we had been hearing from others in Thailand on the—you know, where most of the abuses had been reported up until then. AMY GOODMAN: You found men in cages? ROBIN McDOWELL: Yes, we did. We knew—actually, before we got there, we saw, on the day before we arrived, a picture of a man in a cage. So we knew that was really the goal at that moment. There was—we knew there was someplace near the factory grounds that men were being held. And we told our photographer and our videographer, “This is the goal for you. You need to prove that this is happening.” And when they found it, it was something that the company was not even ashamed of. They showed them—they showed the videographer and the photographer as what was supposed to be a tour of “this is our fishing industry.” It had been going on for such a long time. They had been operating with impunity. They had no fear at that moment, in the early—when they didn’t—before they realized we were doing an investigation. They just kind of like skirted them near this cage, which was basically a company jail with concrete floors. And, you know, they’d go to the bathroom inside this makeshift prison. And so, they got a couple of glimpses with the camera, before they were kind of ushered away. AMY GOODMAN: Robin McDowell, how did these men get enslaved? AMY GOODMAN: Is it usually men? ROBIN McDOWELL: Yes. It’s always men. ROBIN McDOWELL: I think they’re very good—they’re better workers. They’re stronger. It’s a very labor-intensive job. They’re really working 22 hours straight—22 hours a day, sometimes longer, depending on how many—you know, if it’s high season or low season. I think most of them cannot tolerate it. It would be very hard for a woman to, as well. AMY GOODMAN: And talk about how this investigation unfolded. Had you intended to do this long series on, well, perhaps the fish you buy may have been caught by slaves? MARTHA MENDOZA: We definitely intended to find men who were captive and track their product back and figure out where it went. But then, once that story broke, the authorities went back to Benjina, and something happened that never happens in journalism: They began freeing these men. Robin was there on that day. And it was—it was like an exodus. It was unbelievable. AMY GOODMAN: Robin, explain that moment to us. When was it? ROBIN McDOWELL: Nine days after the story was published, the Indonesian government wanted to go to the island to investigate on their own. And they went, and they brought us with them. And they started interviewing the company site manager, financial chief and others. And, you know, we told—and through a translator, they took aside about 20 Burmese fishermen and started interviewing them and asking them about their experiences at sea. And they were horrified by what they were hearing. Not only were they hearing about abusive captains in the waters, but also beatings when they returned to land. So, because the Thai captains could not actually beat them on Indonesian soil, they would hire someone that they called the enforcer, and they would bring them up and march them to the top of a hill near a flagpole with an Indonesian flag hanging up, handcuff them and beat them until they couldn’t stand anymore, and then, in some cases, put them in a little hut up there for a month or two at a time. AMY GOODMAN: What would they gain by beating them like this? ROBIN McDOWELL: Intimidation. 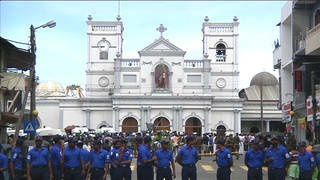 In this case, it was often people who they saw as troublemakers, people who were threatening to run away or demanding to come home—to go home. AMY GOODMAN: Some were whipped by stingrays? ROBIN McDOWELL: Yes, that’s right. ROBIN McDOWELL: Well, it was the tail of the stingray, and it gives a little shock. So, not only does it break the skin, it kind of numbs the skin and gives it—it adds to the pain and adds to the misery, basically. It’s a form of torture. AMY GOODMAN: So, when the men were released, the moment, what was that scene? ROBIN McDOWELL: So, the officials were speaking to about 20 men. And when they realized it would be dangerous to leave the island and have those men be with their abusers, they told them, “OK. We’re going to bring you home. We’re not leaving you here. It’s not safe.” And I asked them at that time, “Wait. Do you mean these 20 guys or everybody?” And they said, “Everybody. We can’t take them.” And I think at that moment they did not realize quite how many men were on that island, because first it was the 20, and then, as word started to spread in the surrounding—in the surrounding hills and the woods, that people were going to get to go home, more and more people came out. And pretty soon, there were like 50, 100, 200, 300. And everybody, as soon as they realized, OK, you’re going home tonight, they start running to their boat, and they would just leap over the rails of the boat and through the windows and grab at their belongings, you know, whatever they could find—their shirts, their toothbrush—jam them in plastic bags and then run back to be counted. It was really—it was really remarkable, remarkable scene. AMY GOODMAN: And did you hear from them once they went home? They hadn’t seen family members sometime in how long? ROBIN McDOWELL: Well, the longest that we found, that our colleague Margie Mason found, was 22 years. AMY GOODMAN: I want to go to one among those kept in cages on the remote Indonesian island village of Benjina. He was one of the migrant fishermen rescued during the Associated Press investigation into slavery in the seafood industry. Let’s go to an excerpt of an AP report. NARRATOR: It was a day Kyaw Naing feared would never happen, reunited with his brother in the small village he left years ago. Just days earlier, Kyaw Naing and seven other men flew home to Myanmar, after years of being used as slaves on Thai fishing boats. KYAW NAING: [translated] I’m so happy. There are no words to describe my happiness. NARRATOR: Late last year, Kyaw Naing was discovered by the Associated Press in the remote Indonesian village of Benjina. He spoke of his life as a slave from behind the bars of a rusty cage. He had been locked up for asking to go home, because he could no longer lift the heavy nets to pull in the lucrative catch. KYAW NAING: [translated] There were people who died on the boat. What I want to say is the priority was pulling out the fish. And because the owners wanted fish, they had to give their lives. For the owners, the fish were more valuable than us. AMY GOODMAN: Kyaw Naing’s return home to his native Burma. How many slaves were freed as a result of the AP investigation? Do you know, Robin? ROBIN McDOWELL: There were more than 2,000. AMY GOODMAN: And how many still exist today, enslaved? ROBIN McDOWELL: We believe most of those who were on the islands in eastern Indonesia are now home. AMY GOODMAN: And how did you track the boats? Talk about the technology you used. ROBIN McDOWELL: Well, we tracked several boats. The boat that we actually tracked from Benjina to the Thai port town of Samut Sakhon was done with a satellite tracker that was on the boat already. And this is something that most boats have. When they’re on international waters, they’re obligated to turn them on. They did not realize, obviously, that we were tracking them. So, we were aware of this boat and these companies, and had been kind of watching them on the internet beforehand. We knew what the process was. But after we saw the fish being loaded onto these refrigerated cargo ships—one, in particular, Silver Sea Line—we watched that and tracked it, the three of us, basically, as it crossed a 15-day journey to the Thai port town of Samut Sakhon. AMY GOODMAN: And they could also find them because of these trackers on them? MARTHA MENDOZA: Nope. OK, so these second batch of boats that had fled Benjina didn’t have trackers on them, but some men had escaped, and some of the owners of these boats had also gotten fishing licenses in a fishery area near Papua New Guinea. So we had an idea of a 500-square-mile region that might have them in them. They—DigitalGlobe, a company out of Boulder, tasked their cameras; a satellite passed over, shot a huge swath of ocean. And when they zoomed in, we were—saw more boats that looked like ours. We shared these photos with some of the escaped slaves and freed slaves, who confirmed those were the boats. And the military, the navy moved in and seized them, and more slaves were freed, and more people were arrested. AMY GOODMAN: Martha Mendoza and Robin McDowell, up for a Pulitzer Prize today for their groundbreaking exposé, “Seafood from Slaves.” We’ll be back with them in 30 seconds. AMY GOODMAN: This is Democracy Now!, democracynow.org, The War and Peace Report. I’m Amy Goodman. Was the fish you ate caught by a slave? We continue our conversation with AP reporters Robin McDowell and Martha Mendoza, co-authors of the award-winning AP series, “Seafood from Slaves.” I asked Martha Mendoza how she tracked where this slave labor seafood ends up here in the United States and what she found. The way we did it was, when that boatload of seafood from Benjina arrived at port, staked out the trucks that were unloading it and followed them to factories. Every shipment from an international company to the United States comes with a custom bill of lading. Those are now digitized, and so we were able to search through those digitized records and find where those companies were shipping their seafood to. That was just the beginning of our hunt, because there’s the seafood distributors in the United States, who will not tell you what brand or label is going on their seafood. When we went back into this again later in the year with shrimp, it was much easier, because the brands of all the major companies, including places like Whole Foods and Wal-Mart, Red Lobster, were being put on the shrimp in Thailand. And so, we just went right off the brands. We ended up having reporters in all 50 states go to supermarkets and identify—take photos of and identify fish that came from the supply chain of these. AMY GOODMAN: But how do you do that from taking a picture of fish or shrimp in a restaurant? MARTHA MENDOZA: Sorry. Let me be really clear. OK, so they follow these trucks to these factories. We use the customs bills of lading, that had been digitized, to show the distributors here in the United States. Then we called and went through business records and went through lawsuits and went through buyers and sellers and actually went to several major seafood conferences to find out where the top distributors of seafood in the United States are selling their seafood to. If you go in the supermarket, you’re going to see your fish with a plastic wrap on it in that fresh counter. And it’s not going to say this is a product of Thailand that came through such-and-such company in the United States. You don’t see that chain. But because these companies in the United States—we, you know, asked them, talked to people buying and selling from them, and found out where their fish went. AMY GOODMAN: So name for us the restaurants, name for us the grocery stores, that carry slave-labored seafood. AMY GOODMAN: Not Costco, but Sysco. MARTHA MENDOZA: Sysco, which their—you’ll see their trucks on the road. And those—and they’re selling to all the different supermarkets, as well. MARTHA MENDOZA: Absolutely. And Wal-Mart is the biggest seller of shrimp in the United States. And, absolutely, fish and shrimp track directly to Wal-Mart. And their response immediately was that they deplore this in their supply chain. AMY GOODMAN: So how did President Obama’s recent ban on slave-produced goods come about? And how does it affect what you’ve discovered? MARTHA MENDOZA: Sure. So, soon after we published our first story, and we’re showing, look, here’s a guy in a cage, and here’s Wal-Mart, it ends up there, and we have—we’ve got the goods, we’ve—you know, we’ve walked you through it as a reader—there was a congressional hearing. And at the congressional hearing, they were discussing, you know, why does this happen. And a member of the State Department actually was put on the spot, as well. And she said, “We don’t allow this to happen. There’s a law that says that slave-produced items are not allowed in the United States.” And so I asked, “Well, when are you enforcing this law? Can we see how it’s—you know, how it’s working?” And they said, “Actually, there’s a loophole: a term, 'consumptive demand. '” If there’s a consumptive demand for an item, then, even if it’s slave-produced, it can be allowed in. After we published a story about this, the entire Congress agreed to change the loophole. And about a month ago, Obama signed into law a measure that included a provision closing that loophole. AMY GOODMAN: I wanted to turn to Gavin Gibbons, the spokesperson for the National Fisheries Institute, responding to the Associated Press’s findings about slave labor in the seafood industry. GAVIN GIBBONS: It’s not only disturbing, it’s disheartening, because our companies have zero tolerance for labor abuses. There are things that people talk about, like boycotts, and they say, “Well, why don’t we just not buy seafood from there?” Well, if you don’t buy seafood from there, then you’re not only not in the conversation anymore about labor, you don’t have an ability to fix it. AMY GOODMAN: So, Robin McDowell, there is the spokesperson for the National Fisheries Institute saying boycotts would be counterproductive. What effect—what’s your response to that? And what effect did your report have on their industry? ROBIN McDOWELL: I think it’s really a difficult question. I will say, when you are doing human rights reporting, it seems like it almost doesn’t matter, to a degree, what governments are saying, what labor rights groups are saying, what human rights organizations are saying. It is when—I won’t say it doesn’t matter, but it is really when the businesses that are buying and the consumers start screaming that things start to change. So I really believe the voice of the American consumer is the biggest impetus to change for these Thai seafood companies. AMY GOODMAN: Let’s turn to George Chamberlain. He’s the president of an alliance that represents the farmed shrimp industry worldwide, the Global Aquaculture Alliance. Chamberlain told the AP the problem is with third-party suppliers, not processing plants. GEORGE CHAMBERLAIN: Processing plants are well controlled and certified and monitored. But what happens if they contract to a third party who doesn’t follow the rules? AMY GOODMAN: Martha Mendoza, respond. MARTHA MENDOZA: So, after that story came out, the buyers at the Global Aquaculture Alliance and shrimp buyers in the United States said, “We will not buy shrimp from any company that is using a third-party processor.” We do know that in Thailand about 2,000 people who were in those processing facilities have now been employed. They have jobs, money, some protection, and their kids are no longer being forced to work. AMY GOODMAN: The Indonesian government has called for a temporary moratorium on all foreign fishing. This is Saut Hutagalung the director of Indonesia’s Ministry of Marine Affairs and Fisheries. He is followed by the Indonesian minister of maritime and fisheries. SAUT HUTAGALUNG: The new government has launched a policy to crack down illegal fishing practices, because we see that this is the bottom of the problem. SUSI PUDJIASTUTI: Thinking of what slavery is happening on those boats, I lost my sleep. AMY GOODMAN: Martha Mendoza of AP, can you respond? MARTHA MENDOZA: Well, the Indonesian authorities are really concerned about this. They don’t want to see it happening. They’ve brought all the boats into shore and are trying to inspect them and find out who’s working on them. And there’s been, actually, eight people now sent to jail over human trafficking because of our reporting there. AMY GOODMAN: I want to now turn to Susan Coppedge, the ambassador-at-large for the Office to Monitor and Combat Trafficking in Persons at the U.S. State Department. This is Coppedge speaking to the Associated Press. SUSAN COPPEDGE: So, consumers should inform themselves, so they can speak to the places they shop and the things they buy, so they can speak through their wallets and tell companies that we don’t want products that are made with slavery. MARTHA MENDOZA: In the European Union, they’ve already put a—what’s called a yellow card on all Thai seafood, and they’re weighing whether or not to put a red card—the soccer analogy being they will ban Thai seafood if the situation does not improve in terms of human rights. The United States’ way of putting pressure is a little bit more diplomatic and political, but the United States is also putting pressure on Thailand to clean up their human rights records. AMY GOODMAN: Last year in California, law firms filed a class-action lawsuit against Costco and its Thai seafood supplier, arguing the company has knowingly sold shrimp whose harvesting relies on rampant human trafficking and forced labor. Men who have escaped from boats in the supply chain have testified to beatings, torture, execution-style killings and grueling 20-hour shifts. The suit seeks to block Costco from selling these shrimp unless they’re labeled as the produce of slavery. So how do they get labeled? This is all Associated Press’s reporting. AMY GOODMAN: And that was in terms of with Nestlé? MARTHA MENDOZA: Yes, this was around seafood in Thailand. So, as a—so they got—they brought in outside auditors, after our investigative report. And those auditors indeed find problems. And typically what a company does is keep that in house. And instead, what they did was publish it and come up with a working plan to do better. AMY GOODMAN: So how do you know if this is ending? ROBIN McDOWELL: I don’t think it’s ending. I think it’s an ongoing problem. We intended to put a spotlight on it and to show what was going on in as clear a way as possible, because so many people had been saying, on the consumer side or the business side, “You can’t prove it. We realize it might be happening, but nobody has really proven it conclusively.” That’s what we set out to do. But it is still going on. Some of the boats that were on Benjina fled and continue to fish in waters as far away as Africa. Some recruiters and brokers, who are now short of men, have started going around, we understand, and trying to find more men. So, it’s an ongoing problem, and that is what we were trying to show. MARTHA MENDOZA: Well, we’re a couple of moms, we are news reporters, and we found this. I don’t buy it. A major corporation that really cares and is really committed to keeping human trafficking out of their supply chain can get meticulous, get on the ground, talk to people, figure out where their products come from. And it may be a little bit more expensive for them, and their profit margin may be a little smaller, but it’s entirely doable for them to follow their product from the producer right onto their store shelves. AMY GOODMAN: So, now, what you’ve accomplished and what you hope to accomplish still? MARTHA MENDOZA: Yeah, we’re more frustrated than gratified. This is a ongoing problem. It stems from the fact that there’s been overfishing close to shore, so fishing now takes place further and further from shore. As a result, it’s a very unaccountable industry, and we know there’s abuses at sea probably all around the world. And so, we want to see industrywide awareness and then change. ROBIN McDOWELL: And it’s not just the Thai fishing industry—Taiwanese, Korean, Chinese. We focused on one particular industry, one company, and followed that chain. But it was exposed to illustrate a much bigger problem. AMY GOODMAN: What do think now when you, yourselves, eat seafood or feed it to your children? MARTHA MENDOZA: I don’t. I don’t eat seafood, and I don’t feed it to my children. ROBIN McDOWELL: I don’t really, either. But, for me, it’s a bigger problem. I feel like, in this global industry, slavery touches almost every product, everything we wear, the things we eat. It’s really—it’s really disheartening. AMY GOODMAN: And when you say that, can you elaborate? Can you elaborate on what you learned about what is produced by slave labor? ROBIN McDOWELL: Well, it’s not just what we learned. What we learned just showed how horrible it can be. When you hear—you know, it could be the tip of your shoelace is made by—made with tiny—you know, children with tiny fingers, or—but you hear about it in every [inaudible]. I think the head of Tesco, at one point, said, after our investigation—it was not tied to our investigation—every product is touched by slavery. AMY GOODMAN: Before we end, Martha, who is the team that made this investigation? MARTHA MENDOZA: So we are a four-woman reporting team of journalists: Robin McDowell, myself, Margie Mason, who’s based in Jakarta, and Esther Htusan, who based in Myanmar. Our editor, Mary Rajkumar, also a woman. AMY GOODMAN: What do you think it is about women and exposing slavery? MARTHA MENDOZA: I think that we were very persistent. I think that we were very dogged in this investigation. But I also think we were not abrasive. We were not—we were not confrontant. We were pursuing. AMY GOODMAN: Martha Mendoza and Robin McDowell of the Associated Press, co-authors of the award-winning AP series, “Seafood from Slaves.” We’ll link to their series at democracynow.org. They are up for a Pulitzer Prize today. That does it for today’s show. We’re on the road on a 100-city tour. I’ll be speaking in Salt Lake City at the Rose Wagner Theater tonight, then on to Colorado. I’ll be in Idaho Springs and Denver on Tuesday, on Thursday at the Boulder Theater. On Friday, I’ll be speaking at Colorado College in Colorado Springs. You can check our website at democracynow.org for all our future visits and speeches and the pictures of our tour so far. Democracy Now! is hiring a broadcast engineer and a director of finance and operations. Go to democracynow.org for more information. Special thanks to Amy Littlefield, Laura Gottesdiener, Denis Moynihan. Child Labor: The Hidden Ingredient to the Billion-Dollar Chocolate Industry?